jxProject is a Java application that comes with an adverstisement supported free version and a commercial version. 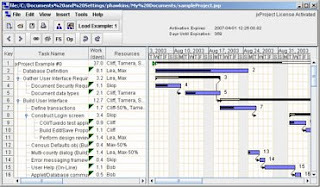 It is a simple project / gantt chart tool. This software requires the latest JRE from Sun Microsystems. Resource User with positive/negative lag. Arbitrary constraints: Start After, Finish After, Start Before, Finish Before. Full Undo/Redo and Cut/Copy/Paste functionality. Full time resource leveling with user ability to enable/disable. A resource optimizer which automatically identifies gaps in resource schedules and moves tasks into those gaps. Tasks may be of fixed work, fixed duration, or fixed span. Task schedule driver is clearly indicated in the table. No limit to the number of links per task. Resource Assignments: Any combination from none, one, multiple or partial resources. Clear and traceable circular constraint violation messages allows user to locate dependency problems. Drag and Drop to move/copy tasks in the table/chart. Fully supports shift work scheduling such as first, second, third and/or swing shifts. Four day, ten hour days 4x10s. Resources inherit schedules from their parent calendars, overriding of parent schedules is fully supported. Each calendar has a timezone which is used consistently throughout all scheduling calculations. Supports scheduling of work time, time off, or paid time off. The user can define Full Time Equivalent (FTE) work hours for display/edit of actual work of resources.